Make someone special’s next birthday very special with this amazing pink birthday cake!! 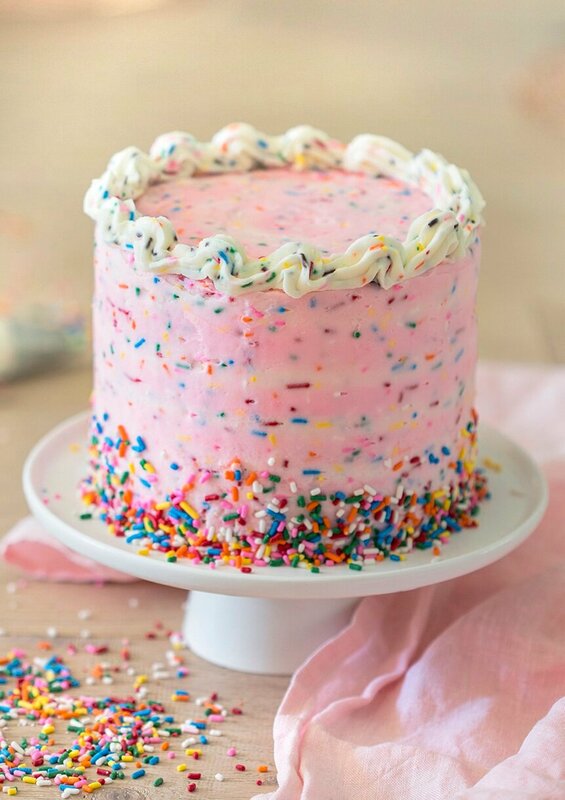 Ultra-moist and flavorful vanilla cake full of sprinkles covered in pink and white vanilla buttercream and even more sprinkles! I have to admit a certain weakness for funfetti. 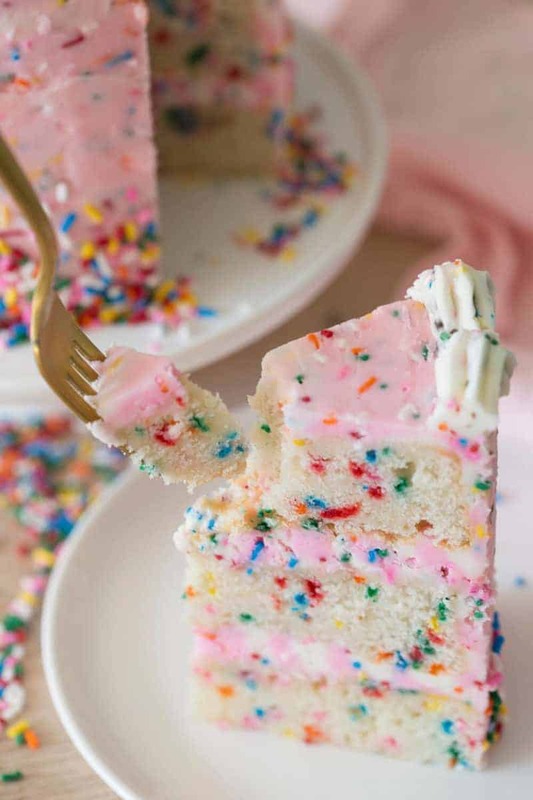 I don’t know if its because I enjoy handling the rainbow sprinkles when I’m baking the cake or if I just really love all the bright childhood colors… Either way it’s a favorite and I think a birthday cake is the PERFECT opportunity to make this cake. Yes there are sprinkles in the buttercream and yes I am 100% into this. If American buttercream is a bit sweet for you try whipping up a batch of Italian meringue buttercream. It’s silky smooth and very creamy, not at all cloying! 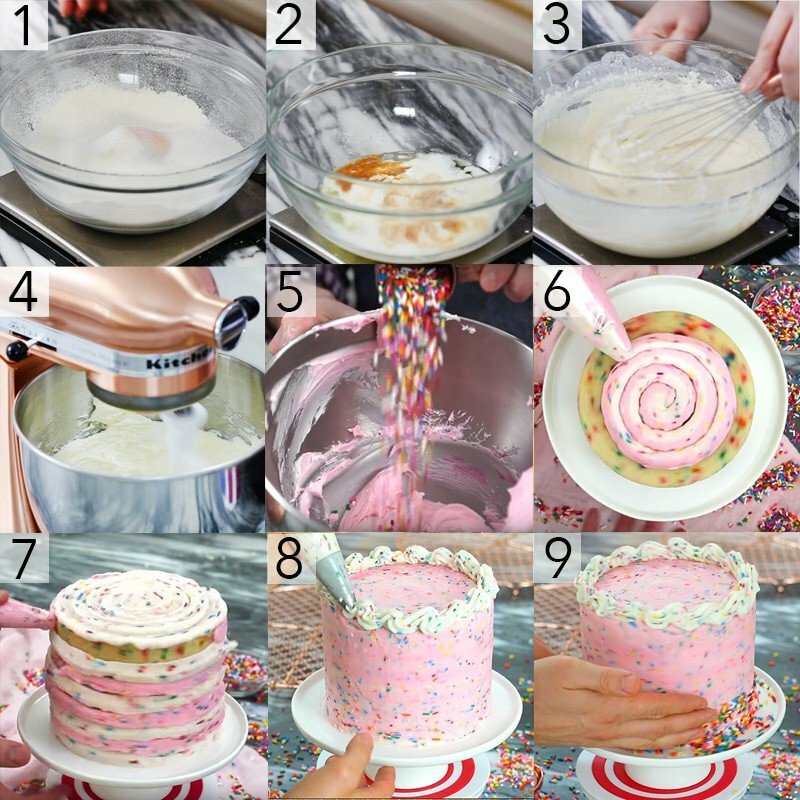 To pipe the two-tone frosting you fill one bag (1/2 way full) with white frosting, one bag with pink frosting and then put both bags in a third piping bag. No need for a tip, just snip about an inch off each bag. 2. Whisk together wet ingredients. I prefer to warm them slightly so there are no clumps, but room temperature works just fine. 3. Add wet to dry, mix and fold in sprinkles. Pour batter into your three six inch pans, which you’ve buttered and floured. I always use cake strips for flat layers with a fluffy edge but they’re optional. 4. Beat the butter until light and fluffy. Add the confectioners’ sugar, vanilla and cream. Mix. Divide into two equal batches and add soft pink food coloring to one. 5. Add sprinkled to each batch of buttercream and fold in to distribute. 6. Fill one bag (1/2 way full) with white frosting, one bag with pink frosting and then put both bags in a third piping bag. Pipe a swirl of buttercream onto the first cake layer then add the second layer on top. Repeat the process. Fill in any gaps on between the layers with buttercream and give a quick smooth. 7. Pipe alternating white and pink rings on the vertical side of the cake and top. Use a bench scraper to smooth the side and an offset spatula to smooth the top. To finish the corner of the cake use the bench scraper to slowly pull inwards while you turn the cake. 8. Transfer some white buttercream to a piping bag fitted with a star tip. Pipe the buttercream on the top edge of the cake using a wave motion. You could also pipe dollops, or a braid pattern instead. 9. Press sprinkles onto the base of the cake and it’s ready to serve!! 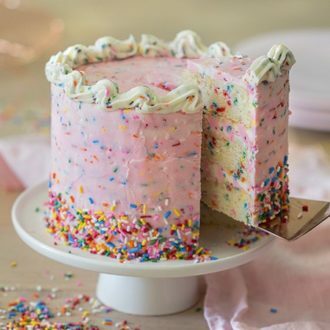 Super-moist vanilla cake chock full of sprinkles covered in pink and white vanilla buttercream and even more sprinkles! This might just be the perfect birthday cake! Butter and flour three six inch pans. I use cake strips on my pans for more even baking as well. Preheat oven to 340F. Beat the wet ingredients together in a medium bowl. Add the wet to the dry and mix until just combined. Fold in the sprinkles at the very end and mix until just combined. Bake at 340 for about 25-30 minutes or until the centers are springy to the touch. Beat the butter until light and fluffy. Add the confectioners' sugar and cream and mix. Divide into two batches and dye one with the pink food coloring. 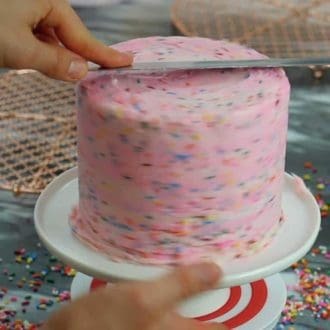 You will stir in about 1 tbs of sprinkles into the white buttercream and 1/4 cup into the pink buttercream. Transfer both colors to 2 piping bags. Snip off the tips. Transfer both to one piping bag. Snip off the tip. Pipe buttercream between the cake layers. Cover the cake with a thin crumb coat and chill for a few minutes. Once the cake has chilled, pipe buttercream on the outside of the cake. With a steady hand, work your way around the cake until it is completely covered with the buttercream. Use the regular buttercream and pipe the pink and white buttercream between each layer. You can get a two-tone effect by filling one bag with white buttercream, one with the pink and then placing both in a third bag. 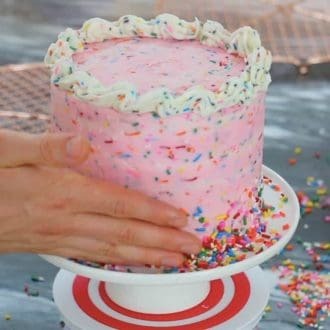 Lightly press confetti sprinkles on the bottom of the cake and then pipe the white Italian buttercream using an 869 tip. What sprinkles brand do you use? 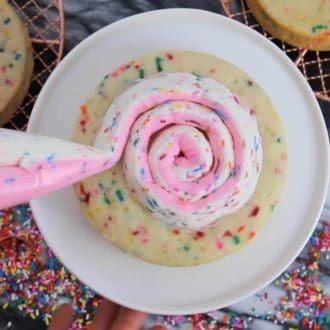 I tried a similar came however the sprinkles color dissolved into the mix! Hi Lucy — I like to use Jimmies! When I don’t, I look to Amazon. Hope this helps! Best, John. What size of cake pans are these? Can’t I sit to try! Hi Jessica — Use 6-inch pans. I also updated the recipe for this reason. Hope this helps! Best, John. Thank you so much!!!! Is 6×2 good? Loving the blog! I’ve made the sage pasta, the ultimate chocolate cake, and the shrimp scampi – all are excellent! Question: what do you consider wet ingredients? Your instructions are just a little a vague. I know in many baking recipes, sugar is usually part of the wet ingredients. Does it matter? Hi Dan — A wet ingredient means that the ingredient was “wet” before it was added to the recipe 🙂 aka sugar is a dry ingredient. I hope this helps! Best, John. When you say “beat” did you use an electric whisk or by hand? Hi Zoe — hand mixer 🙂 Thanks, John. I’ll gladly send you a picture if you’d like ! Hi Lola — Yes, room temperature butter would be a wet ingredient. Thank you for the kinds words and support. 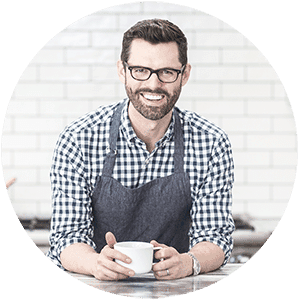 I am always interested in hearing how the recipe works for other people. Best, John. John, First off it looks like you respond to your viewers comments which is great! I have been on other blog sites where the author does not comment on questions-not helpful. Would you say that crumb for the funfetti cake is more dense? I am considering this recipe for cupcakes and don’t want the lifeless, airy type of cake. Hi Wendi — I appreciate the feedback! 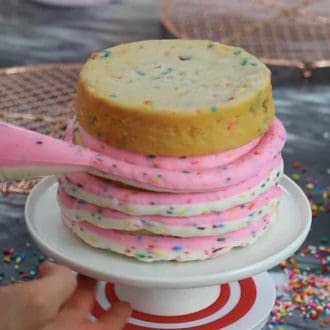 The funfetti cakes are definitely denser than some of the other cakes on this blog. I recommend giving it a go! Best of luck, John. I just realized I’m out of unsalted butter ???? In your opinion would using salted butter, what I have in stock, alter the recipe results significantly? Is there another ingredient I could reduce to make up the difference? Hi Noreen — It shouldn’t change the recipe dramatically. I prefer unsalted butter because it allows me to be more aware/in more control of how much salt is in my food. Let me know how it goes! Best, John. I’ve been teaching myself how to bake for while and I have to tell you that of the hundreds (!!) of recipes I’ve tried, this one is the best by leaps and bounds. I will never make another recipe other than yours! Thank you! Hi Hope F — Thank you so much for the kind words! You have no idea the kind of impact comments like yours have on me. Thank you again. Best, John. I would triple the recipe! Hi! Love this cute cake! I am making it for my daughter’s 3rd Birthday. Can I use 8 or 9 inch cake pans instead? Would I need to adjust the recipe any? I don’t have 6 inch cake pans, and I need it to serve a little more. Also, if I don’t have something for piping the frosting do you have any tips on how to do it? Thanks so much! If i don’t use yogurt in the recipe, will that change the cake? Unfortunately, an absence of yogurt will change the consistency of the cake. You can use sour cream instead! I am hoping you can help me out because I printed this recipe about 2 weeks ago and it listed sour cream instead of plain yogurt . I just made the cakes and used the plain yogurt ( I know they both are essentially the same when baking) but I was thrown off again because the printed recipe also called for salted butter and this one doesn’t. I am so not used to mixing the wet ingredients the way you say to. Normally I whip the butter and sugar together and then add the eggs and vanilla. I am baked by myself a test cake as well because I want to use this recipe for a cake order. I can’t wait to eat it! Anyways, is there a reason why you switched out the sour cream and salted butter? Thanks! I actually do the recipe both ways! I think I changed the sour cream for consistency. The plain yogurt won’t noticeably change the flavor of the cake! Just made this cake and am extremely pleased at how it turned out. It is a denser cake but is still so delicious. I had made an egg white batter cake once before that turned out very dry but your recipe was far superior to the previous one I had used. I must ask though why just egg whites? Why not use the whole egg? I use egg whites for the color! It keeps the batter a bit whiter! When you bake your next cake, I would love to see the results! Is this recipe good for cupcakes? Hello, I’ve been following your instagram and decided to try your recipe for my niece’s first birthday. I wanted to point out that you have an error in the instructions…you mention blue and yellow coloring for the buttercream. I’m guessing you just used pink and regular buttercream in the depicted cakes in this post? Can’t wait to try your recipe! Thank you so much! Let me know how it turns out! Just want to clarify did you use Italian and Swiss buttercream for this cake? You mentioned Italian buttercream in Step 4 when Assembling . Thanks! I used vanilla buttercream for the cake! Hope you enjoy! Divide the buttercream half, dye one batch pink! Hope you enjoy! Hello! I love all your instagram videos! They are really amazing to look at and I can’t wait to try to make a cake! Do any of these cakes need sugar syrup or is it really moist the with the yogurt/sour cream? Thank you so much! I never use sugar syrup because the sour cream will keep the cake really moist! This cake has vanilla in it, so I usually wouldn’t want to add more vanilla flavor! You can totally use flavored yogurt though! I use standard piping bags for decoration! When piping a swirl, I usually fill each bag about half way or more, then refill when I run out. You could always order large bags for double bagging! I’m so happy you liked the cake!! If you wrap it up in plastic you can freeze the cake ahead of time. It’s not going to be super fluffy, but will still taste great for a birthday party!